The leaders of five political parties have taken part in a live TV election debate - but Theresa May and Jeremy Corbyn sat it out. There was little disagreement between the leaders of the Lib Dems, Green Party, Plaid Cymru and the SNP as they repeatedly clashed with UKIP's Paul Nuttall. Brexit was a dominant theme, and the panellists also turned their fire on the absent Tory and Labour leaders. 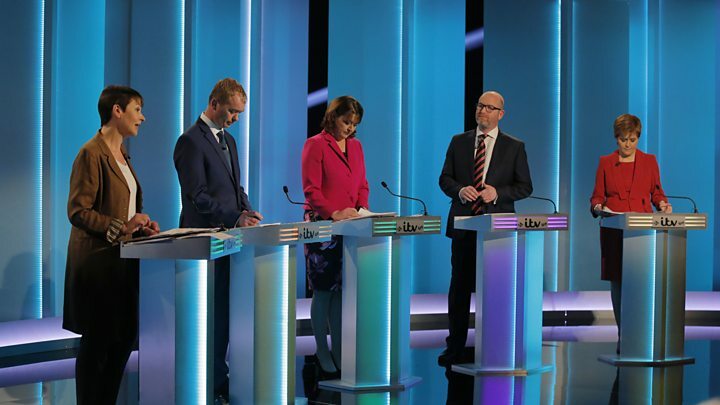 The ITV debate took place in Salford. Four of the five panellists - Lib Dem Tim Farron, the SNP's Nicola Sturgeon, Plaid Cymru's Leanne Wood and Green Party co-leader Caroline Lucas - had backed staying in the EU. Mr Nuttall - who apologised after twice calling Ms Wood "Natalie" - found himself the target of their attacks throughout, with Ms Sturgeon calling him Theresa May's "spokesman". "There isn't a single question to which the answer from Paul Nuttall isn't immigration," said Ms Lucas. The four pro-EU parties warned of an "extreme Brexit" and Mr Farron and Ms Lucas both said people should get the chance to stay in the EU through another referendum. Brexit "is where our future lies," hit back Mr Nuttall, telling Mr Farron he could "cry all he wants" about the referendum outcome. The UKIP leader warned the UK government could still "sell out" over fishing rights, "capitulate" over the Brexit divorce bill and do a "dodgy deal" on immigration. Ms Wood warned of manufacturing job losses after Brexit and said Wales had been "pretty much ignored" since the EU referendum. "Gibraltar has had more attention than Wales has had," she said. Mrs May has said she will not take part in any live debates, and Mr Corbyn has said he will only take part if she does, so neither the Conservatives nor Labour were represented on the podium. Ms Sturgeon said Labour could not hold a Conservative government to account and promised her party would "make sure that Scotland's future is always in Scotland's hands". She also defended Scotland's education system, saying the Scottish government had "some challenges which we are working really hard to address". Lib Dem leader Mr Farron occasionally found himself criticised over tuition fees and his party's role in the coalition government of 2010 to 2015. He warned of a "Theresa May majority of Margaret Thatcher proportions", and on his pledge of a second EU referendum, added: "I will give you the final choice on the final deal - and if you want to remain, you should be able to remain." It was the first of several election specials scheduled to take place ahead of the 8 June general election. The BBC will hold a Question Time special on 2 June in which Mrs May and Mr Corbyn will face audience questions consecutively. Ms Sturgeon and Mr Farron will appear in another on 4 June and there will be a live debate featuring senior figures from seven parties on BBC One on 31 May.